Hi, I am interested in your 1961 Nash Metropolitan (stock #4809-CHA) listed on Autotrader for $14,995. I'd like to get more information about this vehicle and confirm its availability. 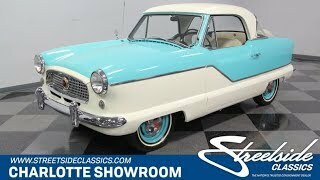 This 1960 Nash Metropolitan is a cool little car with an international perigee. Despite its small size, it has a huge enthusiast following. And this example does it best with the right original pieces mixed with the right investments. The Metropolitan might be European sized, but the coupe carries plenty of American design flair with its full chrome front end and continental kit in the rear. Thats what makes these cars so cool today. A series IV model like this one is especially desirable because its the only one with exterior access to the trunk. Plus, the later cars had bright side trim thats a great dividing line for the two-tone finish. The Frost White and Caribbean Blue looks like the perfect color combo for this period, and it has been recently resprayed to give this nostalgia extra shine. While this is small in size, theres big detail work. For example, the chrome hubcaps over painted steelies and whitewalls match so nicely with the body. Austin of England might have built these Metropolitans, but they did it specifically for American Motors with Americans in mind. So inside, the two-tone split bench seat is deep enough and the legroom is good. These coupes do also have a back seat. Its not exactly roomy for passengers, but its similar black/white appearance makes for a well-presented storage shelf and interior access to the trunk. The driver gets one large main gauge pod dominated by a speedometer, but since the car was sourced from Britain, it happens to be a Smiths readout. So just imagine the looks on peoples faces as you compare this Met to Jaguars and Aston Martins. Under the hood is the original 1.5-liter motor, and it looks fantastic with its block in classic green. These were sourced from Austin who are the people that really know about how to get the most out of a small power plant. In fact, this B-Series motor is related to the MGA 1500. This was a popular engine in Europe, and parts are still easy to find and relatively inexpensive. The motor has the right size to be frugal on fuel when you need it, but fun when you want it. After all, the original three-speed manual transmission gives you full control over the power, and with smart gearing, it cruises at 60 MPH without complaint. With a tight turning radius and nippy handling, this American Nash feels like a proper European import. Whether youre a Nash enthusiast or just looking to have some fun cruising the town, this little Met packs plenty of fun and head-turning appeal in a small package. Call now!